Yesterday after getting back from our vacation we hung out at Mom's parents house for fathers day. 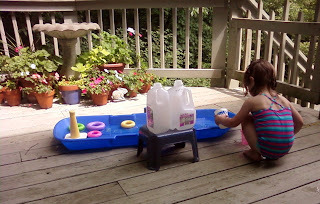 While we were there Alyce was outside on the deck playing with her own little pool. Alyce's pool consists of a snow sled filled up with water. It is a great way to hold water since it only gets about a few inches deep and provide lots of surface area for laying down in the water or floating lots of toys. Alyce also had a second green bucket of water that she would transfer water to from the sled. She used two milk jugs to do the transfers. 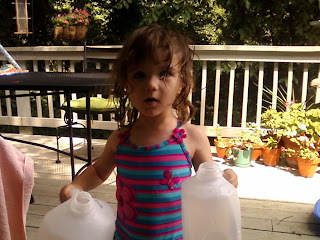 The cutest thing about Alyce pouring out the water was that she would tap the jug a few times to make sure the last drop made it into the bucket. With all the toys she has she gets the most enjoyment from two milk jugs and some tap water. 0 comments on "Playing in the Water"